08 Aug 2016, Monday. I didn’t want to wake up this morning. No, it wasn’t because of the “end of holiday” syndrome, but my entire body was aching. For the first time in a very long while (and the first time on this trip), I lay in bed until 9am. The hotel’s breakfast was from 7am to 10am. So I knew I was gonna miss breakfast if I didn’t pull myself out of bed. So reluctantly, I dragged myself out of bed, washed up, got changed, and headed downstairs to fill my stomach. While at breakfast, a mild, throbbing headache started developing. “Oh, oh. Not good.” I said to myself. I recognised the signs. I think I’m falling ill soon. Being only 240km away from home, it wasn’t difficult to decide my destination for today. Day 49 – Malacca to Singapore! Homecoming! But before heading out of Malacca, I stopped by a local Kawasaki Service Stop to get my engine oil changed. Well, I *could* have made my way back home without the oil change, but the gearshifts were beginning to feel rough, and as I was carrying the oil with me (what’s leftover from the previous oil change), I wanted to lighten my load. I supplied my own engine oil and oil filter. RM10 for the labour. I was quite amused by this advertisement. I think it’s promoting some beauty product. A very interesting choice of model there. Kekek. 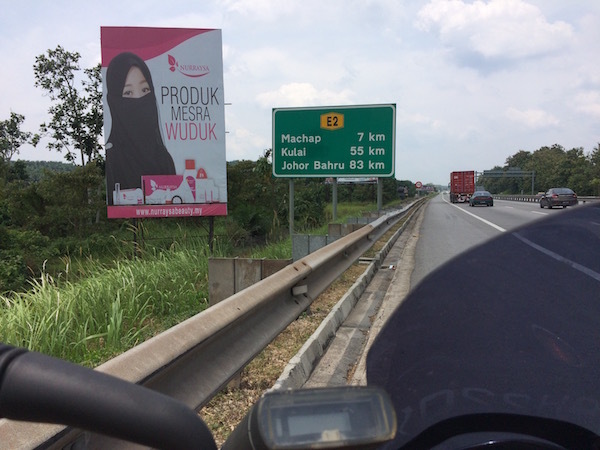 And after some 2.5 hours of riding, I reached the Johor Bahru (Malaysia) – Woodlands (Singapore) border. No pics, and I won’t bother describing the process. It’s very neat, very organised, and easy-peasy with zero border corruption. And since Singapore is so small, it took just a mere 25 mins from the border to reach home. 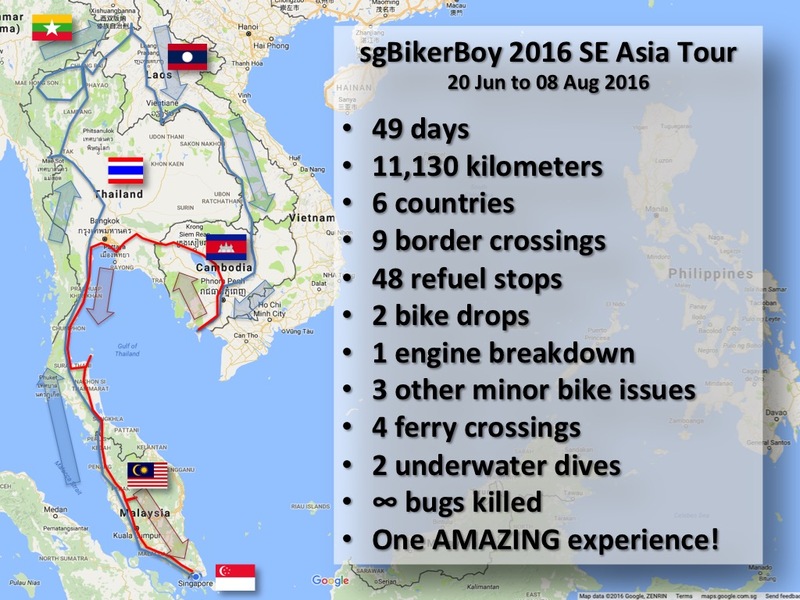 sgBikerBoy 2016 SE Asia Tour Stats. 49 days, 11,130kms, 6 countries, 9 border crossings, 48 refuel stops, 2 bike drops, 1 engine breakdown, 3 other minor bike issues, 4 ferry crossings, 2 underwater dives, ∞ bugs killed, and One AMAZING experience! I got home just in time for National Day (09 Aug) – Singapore’s independence day. It means alot to me as I’ve never missed a National Day in Singapore, and I certainly didn’t want to spend this National Day in another country. 49 days, 11,000kms, 6 countries and 1 AMAZING experience! The sgBikerBoy 2016 SE Asia Tour. Welcome home. Planning a trip of the same nature. Maybe can catch up for a casual coffee with you. Sure! I definitely encourage you to go for it! Hurrahh! Welcome home Bro. Congrats and a few dozen thumbs UP to U and your bike! Wished I had the same/enough courage to attempt a trip like this alone but sadly…..no. I’d be lucky if I could reach the Thai border intact (HaHaHa!!). Anyway, if U ever decide to turn this into a book titled “Guide Book to Adventure Far Up North On Two Wheels” or something, I’d be in Q to get one. Cheerio! Thanks! It’s not that fearful once you’ve STARTED the journey. The trepidation really is just in the beginning and planning phase. After which, just flow along and take anything as it comes! It’s interesting that you mentioned a book. While I’m NOT planning in writing one (I hate writing), I did thought of turning this into a pictorial coffee-table book for personal use. No intentions of commercializing it though. Biggest challenge is sourcing for a publishing / printing house willing to do this in low volume at a reasonably low cost. I’d likely be re-commencing my Sunday rides to Malaysia (not this Sunday though – the missus is flying off and I’m the designated transport guy), so look out for them and do join us! Awesome man. I’ve been following your trip, and am glad you made it home safe and sound. I wondered if you could have avoided all the bike problems had you bought a Japanese bike ( which are more well known for their reliability) instead of an Indian bike. Having a major engine failure and brake failure on the road are definitely not good indicators of reliability. What made you choose a Bajaj in the first place? I got my 2B license in Jan this year. So I’m limited to 2B bikes. I wanted to get something with as much cc as I could, and the choices are very limited in Singapore. I DID look at the Japanese – and eyed the Honda CBR150R. But thought a 200cc would suit me better. I wasn’t in the lookout for a scooter. So my choices really were the 200NS, the Duke 200, and maybe the Phantom. Comparatively (on paper at least) the Phantom’s a little underpowered for a 200cc. And it’s an old machine. The Duke and Pulsar were essentially made in the same factory in India with the latter costing so much less. I do have intentions of upgrading my license later, and so decided to settle for something economical yet sufficiently powered for now. PS the new Honda CB190R looks promising. But on paper, the specs are quite far behind the Duke and the Pulsar. Chanced upon your blog. An interesting read & updated info that will come in very handy when I begin my 1st solo ride to Vientiane in 3 weeks time. Thanks for the info bro. Ride safe & enjoy the ride..
Have a great time! Ride safe! Good to see you made it back in one piece. When will be your next one? Thanks! Well, I’d love to, and I’ll have to find the time for it! LOL! Mannn.. i hate that it came to an end. I was feeling like i was together with you on your journey. Great experience. Great write-up. Great read! I couldn’t have done it so myself when i wish i would. Great job bro! Hope you have a similar part again! Cheers. Next Next post: Happy 51st Birthday Singapore!